Contacts are everyone you need to keep track of that isn’t a patient or client. This can include Insurance companies, Referring Doctors, Case Managers, Suppliers, etc. If you already have a database of Contacts you wish to import into your Nookal account, you can do so with a CSV file in Practice > Integrations > Import Data. 1. To add a new Contact navigate to the Contacts tab in your Nookal account. 3. Enter the Company AND/OR the First Name and Last Name for this Contact in the window that opens, these are the only required items needed to create a Contact. Contact Details (and a note of the preferred, or best way to communicate). Double check any Doctors’ Provider numbers as these will need to be correct for use for Online Claiming. 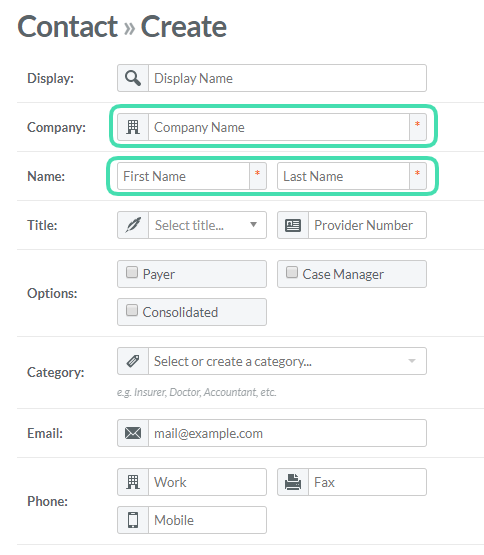 Name of the Contact person – if there are many Case Managers with different contact details, we recommend creating a new Contact for each of them. Email address if communicating by emails.